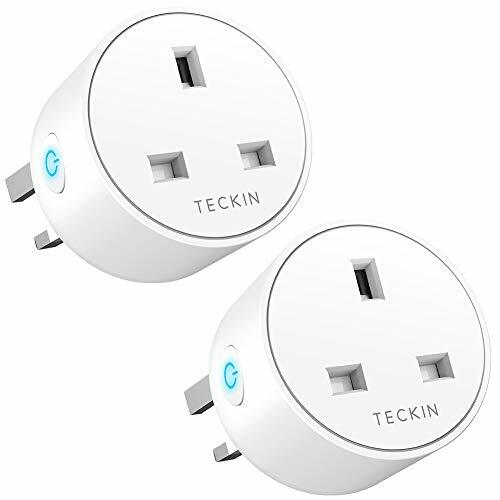 - 【Safety Design and Set Up Easily】The socket slot with Sliding Safety Cover will prevent children from inserting fingers or other objects into it.Simply plug TECKIN mini outlet into an electrical outlet, connect a device to the Smart Plug, and wirelessly control your device using a tablet or phone. A secured 2.4GHz WiFi network is required. - 【Remote Control】 Control your electrical items via your phone whenever and wherever you are after downloading the FREE APP Smart Life as long as there is a network. Ideal for someone who can not move around very well and needs easy access to turn on/off a device. - 【Voice Control】Compatible with Amazon alexa, Google home assistant and IFTTT, control your home appliances with the smart plug by simply giving voice commands to Amazon Alexa or Google Assistant. No Hub Required, the smart plug SP27 works with any Wi-Fi router without the need for a separate hub or paid subscription service. - 【Quality Guaranteed】 The Mini Smart Plug features a sleek new design that is FCC approved product. If you encounter any problem or need support, please feel free to contact us through following E-mail support.eu@teckinhome.com or Amazon directly. We offer two years of warranty and replacement services and lifetime technical support services if the plug is defective.